Something is charging along the track towards us, heavy with goodies and picking up steam. And no-one expresses the mounting excitement better than Marcus Berkmann. Through pizza analogies and Dr Who villains, Berkmann sieves through his life in Ashes series and finds anticipation, inadequacy and fear. 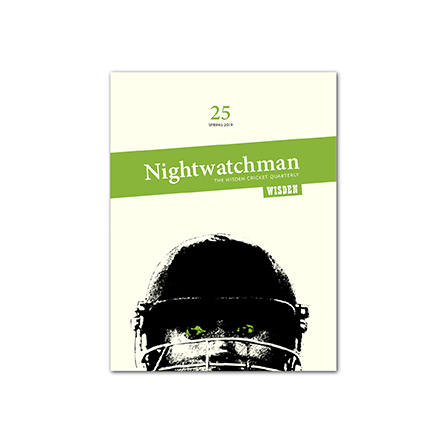 He did write it before Australia were all out for 65, but, hey, those baggy greeners invented mental disintegration. A beautiful photograph of jacketed and Brylcreamed black and white men queuing outside Lord’s in 1946 plonks the piece in context. And I learnt a new word: stanchion. What more could you want as you count down the days? A raspberry ice-cream of a read, with chocolate sprinkles. Soon, very soon now, the Ashes will come. When they do, we shall watch them. We shall talk about them, possibly unceasingly. We shall certainly think of little else. Occasionally we shall hide behind the sofa from them. Daleks have nothing on a Michael Clarke double century. Cybermen cannot compete with Stuart Broad’s sudden and unexplainable losses of form. But before all this, there’s important work to do. There’s waiting for the Ashes. For two-and-a-half long and sometimes dispiriting years, we have sat patiently through miserable South African series, weirdly triumphant Indian series and equally miserable New Zealand series. We have bided our time. We have tried to pretend that these other series matter just as much, when clearly they do not. We have waited, and we now cross the road very carefully, in order not to be run over by pantechnicons, because that would be a terrible waste of all this waiting, just as it’s all about to kick off. Psychologists will tell you that one of the symptoms of the mental disorder commonly known as “happiness” is the ability to defer gratification. Save the best till last. Looking forward to something is as enjoyable as the thing itself. Miserable people eat the centre of the pizza first and end up with all the boring bready bits at the end. Whereas my last forkful is all topping and the tastiest of them all. The equivalent, if you like, of Kasprowicz getting caught behind at Edgbaston in 2005 with three runs to win. England cricket fans do not need to measure out their lives in coffee spoons: we have our own, utterly reliable internal chronometer. Not long ago I was sitting in a pub with my old friend Stephen, who is not a cricket fan, but a decent fellow nonetheless. “Which year did I get married?” he asked, for he was experiencing the customary mid-evening memory blank. “1997,” I said, without time even to think. “How do you know that?” said Stephen, looking suspicious. “Because before the speeches I popped into the bar, and up on the TV screen Greg Blewett had just reached his century, his third in three Ashes Tests,” I said, although his eyes were starting to glaze over. I don’t recall much else about the wedding, but I do remember the expression on Blewett’s ratty little features in 3D high-definition Memory-vision. By comparison, the years between Ashes series fade into opacity. In many ways it’s an absurd anomaly that England-Australia matches so outshine all the others. This summer you can get into a New Zealand Test for about the price of a pork pie; whereas buying a ticket for the Ashes Test at Lord’s means selling your house and several family members to get a restricted view behind a stanchion in the Compton stand. Just being there says something about your wealth and status that cash never can. A few years ago I wrote a book about the Ashes, and interviewed several men of a certain age whose formative cricket-watching experiences had been to see England against Australia at Lord’s in 1972 or 1975 or 1977. Every single one of them had turned up on the day, bought a ticket and sat in a crumbling wooden stand behind a horde of fantastically pissed Australians. No one had had to book nine months ahead by credit card, or hope desperately that some corporate lackey they had buttered up would invite them for a freebie. It was, in short, a different world, and one which we all wish we lived in now. Nostalgia tends to be selective, and therefore misleading. But I think it’s fair to say that the excitement we felt in the 1970s and 1980s at the prospect of an Ashes series was not yet tempered by dread. England and Australia may not always have been evenly matched, but the series were fairly evenly shared. Then came Year Zero of 1989. I don’t need to go through the details. You will carry them with you until the day you die, and possibly beyond if all the rumours are true. What’s extraordinary is that when Steve Waugh spoke of “mental disintegration”, he was only actually thinking of the other team. The cricketers who represented England in those years only had to endure this hell once, twice, maybe three times in their careers if they were lucky. But for the supporters, it was a life sentence. It is we who have suffered the full long-term effects of mental disintegration, as few sports fans can have done before or since. These are scars that do not heal overnight. Despite the glorious victories of 2005, 2009 and 2010-11, and another series in 2006-07 we can’t remember anything about at all, England supporters still find it hard to acknowledge that we begin this series as favourites. We hope we will win. Some of us have started praying that we will win. But we are not so foolish as to expect that we will win. We are the generation of sports fans who, when Glenn McGrath says it’ll be 5-0, cannot vanquish the ghastly, bowel-scraping suspicion that he might be right. Australians cannot even begin to understand this. They see Lord’s and egg-and-bacon ties and the effortless sense of social superiority of the English upper-middle-class male, and as always, they bridle. But they misread the signals. Even the most breezily relaxed English toff suffers the same deep-seated cricketing inferiority complex as the rest of us. Surface confidence is merely that. And we are all desperate not to tempt fate. For instance, it has been said that this might be the weakest Australian team to reach these shores in living memory. But it has not been said by me or anyone I know. We dare not even think it. We cannot allow ourselves even a moment of complacency, for otherwise, all will be lost. 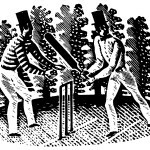 Utterly average Australian cricketers – for some reason Greg Blewett comes immediately to mind – can become world-beaters overnight, given an opposition vaguely English in shape and size. Our inferiority complex is matched by their superiority complex. It’s a uniquely depressing combination. And so we wait. As I said, it’s the best bit. But that’s only because we know from bitter experience that what will follow could be much, much worse. Marcus Berkmann writes regularly for Private Eye and The Oldie and has been pop music critic for The Spectator for 25 years. His books include Rain Men (1995), Zimmer Men (2005) and Ashes To Ashes (2009). At university he founded the Captain Scott Invitation XI with Harry Thompson, and has been running a team called Rain Men since 1998, shamelessly named after the book. It is 24 games and 21 months since the team last won. In 2012 he hit the best shot of his life, which was caught an inch off the ground by a man with tattoos.